Hai-Ting Chinn, Jeffrey Gavett and Natalie Raybould in Yesterday Tomorrow at La Mama Ellen Stewart Theatre. Photo: Maria Baranova. Annie Dorsen’s show Yesterday Tomorrow in which the performance decisions are made by a computer algorithm is so successful one wonders if we should not let computers take over the theatre. I jest, but ceding parts of the human role of director to computer software in this situation unexpectedly creates a funny, joyous, and twisting journey of sense to nonsense and back to sense again. This “algorithmic concert” toys with the idea of who is in creative control and surprisingly, for such an intellectual exercise, human pleasure is the overwhelming result. 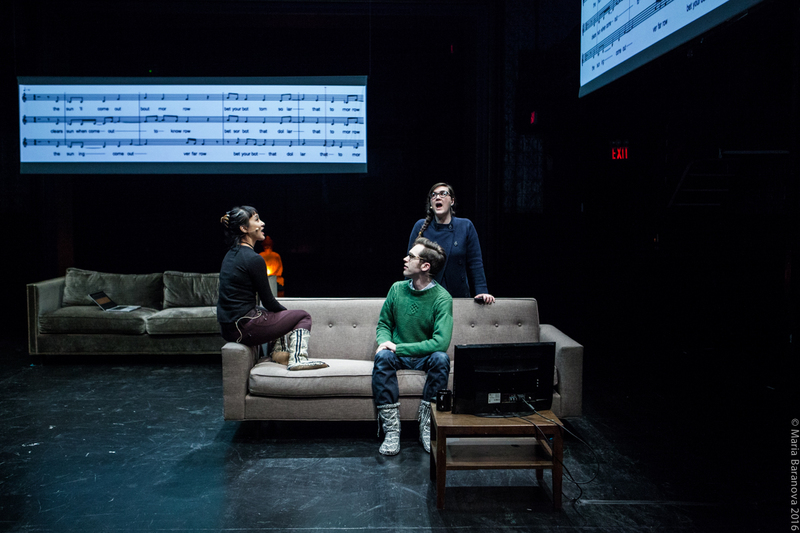 A cast of talented and experienced singers (Hai-Ting Chinn, Jeffrey Gavett, Natalie Raybould) expectantly await their instructions from an unseen computer which through an algorithm makes the musical and performance choices to convert the song ‘Yesterday’ by The Beatles incrementally into the song ‘Tomorrow’ from the musical Annie. As we watch the performers sitting on sofas with large projection screens of the sheet music for each of their parts, we can follow along as they begin in unison and then the computer instructs them to begin to break apart. It feels like a perpetual canon that has lost its way. The cast wears headsets and they physically move with certain cues but the singing is almost continuous, save for the brief moments when a cycle of the “song” has ended and the new cycle is about to begin. Bits of Yesterday fall into Tomorrow-like patterns. Or are pieces of Yesterday getting swallowed up by Tomorrow? The computer created lyrics “Though they’re stuck don’t stay,” is a lost cousin of the actual Annie lyrics “When you’re stuck with a day.” The actual output changes with every performance but no matter what the computer helps the singers find their way home. On this meandering road, there are moments of unexpected poetry and computerized kismet which we can emotionally invest in. When sung in the order the computer has chosen, a call and response happens between the voices. One singer begins with “there’s” another responds with “the sun” and back to the first with “come.” Suddenly, there’s a beckoning between the pieces of the two songs. The songs are not just verbally shifting but musically morphing as well. Sustained notes for some performers become staccato for another. Words and notes are dragged out by one voice while the others zoom ahead. The overall vocal levels shift. The voices fall to more of a whisper as the process begins to speed up. At this speed and with all lost context, logical sense collapses entirely. The voices slow down again. With reverb and a tinniness, they evoke radio programs on the far edge of the dial where you can only catch a phrase here and there as they drift in and out of their frequency. Like a lapsed Catholic at a Latin mass, these pieces reflect the memories of something vaguely recognizable which you feel like you “know” in your bones but the actual words are totally foreign. The underlying structure of language and these famous songs are there. That’s our familiar touchstone even if the surface result is a garbled echo of that. These invented verses and unexpected tunes push and pull at that familiarity. The experience of recognizing flashes of the songs or simply engaging with the curious invented hybrid tune is delightful and playful. The performers move more rapidly around the space until they find themselves together on one sofa, unified like the song that is returning to its form. We don’t know what is happening but we can feel the alignment coming back together. ‘Yesterday’ feels like a faint memory now in the lyrics. As ‘Tomorrow’ starts to coalesce, each vocalist sings “Come out,” but at slightly different times. There’s a rush of hope and renewal as you feel the complete song emerging on the horizon. Yesterday Tomorrow was part of our coverage of COIL 2016. For more information click here.